READ MORE Formulation & Adjuvant Technology via Agropages Magazine. A current trend in the agrochemical industry is the need for “greener” chemistries that also work well. This is no surprise in an environment with growing regulations. However, the notion that bio-based chemistry, or “green” chemistry, is not effective and is too expensive, is not true. A sustainable resource that yields bio-based chemistries for the agrochemical industry, and is equally effective, competitively priced, and abundantly available is the “pine tree”. While there are numerous ingredients in an average pesticide formulation, adjuvants derived from a pine tree ensure an efficacious and “green” formulation. A pine tree is a renewable resource that provides multiple options to enhance the performance of a pesticide formulation through bio-based emulsifiers, solvents, and stickers. It is imperative for the grower to use pesticides accurately to ensure high efficacy. However, it may not always be possible. Growers need to optimize the amount of pesticide delivered to the plant, by using adjuvants in conjunction with pesticides. Adjuvants may synergize with the surfactant system in the pesticide formulation, which wets the leaf surface. They may also ensure that the active ingredient is available to the plant’s surface for the required absorption time. Regardless of the actual benefit, an adjuvant enables the grower to deliver the ideal amount of pesticide to the plant, thereby avoiding overuse or underuse. This improves the plant’s health and yield, enabling the pesticide manufacturer or formulator to succeed. Different types of bio-based chemistry, including chemicals such as tall oil fatty acid (TOFA), tall oil (TO), and terpene resins, are derived from the pine tree. Known as the fourth most abundant component in a pine tree, TO contributes about 3 percent by weight to the pine tree. TO is collected via the kraft pulping process, which results in an intermediate called crude tall oil, which is distilled through a biorefinery. The major products of the distillation process include TOFA and TO, which are used in various industries, including agricultural chemicals (see Figure 1 below). Once neutralised to the corresponding salt, TOFA or TO can facilitate emulsification in crop oil concentrates. A well-emulsified formulation ensures that the pesticide is distributed evenly and delivered properly for end use. TOFA and TO also soften the waxy leaf surface to improve penetration of the active ingredient. What’s the difference between TOFA and TO? 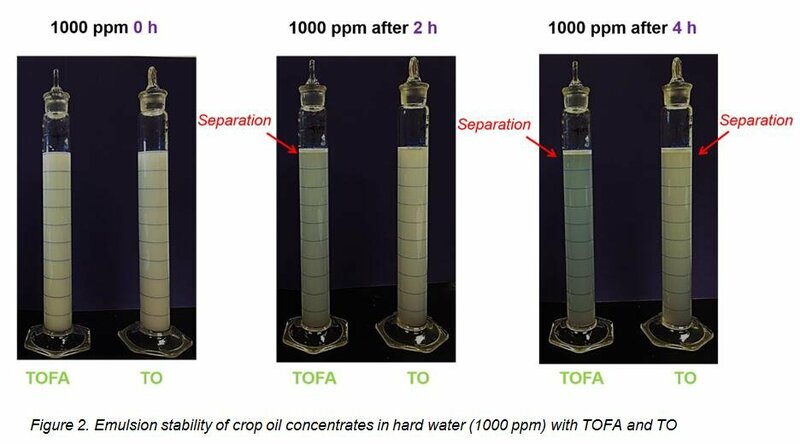 A major difference between TOFA and TO is the rosin content. While TOFA consists of 1 to 5 percent rosin, TO usually has about 10 to 28 percent rosin. This composition difference can be utilised to tailor physical and performance properties, such as viscosity and emulsion stability. In general, higher amounts of rosin lead to slightly higher viscosity of the compound and improved emulsification of the formulation. The agrochemical industry typically uses TOFA. However, TO allows better emulsion stability, particularly under hard water conditions (see Figure 2 below). TOFA can also be esterified using methanol or other alkyl alcohols. 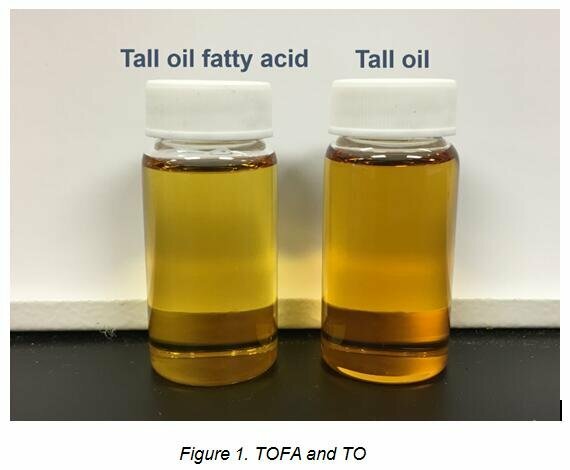 TOFA esters have a lower freezing point, compared to the acids that allow TOFA esters to be utilized as solvents in both adjuvants and pesticides. TOFA esters have lower volatile organic compound (VOC) values than some petroleum-based solvents. Alternatively, TOFA can be ethoxylated and act as a non-ionic surfactant. Hydrophile-lipophile balance (HLB) values can be varied by altering molar ratios of ethoxylate. Another important intermediate derived from the pine tree pulping process is turpentine. It can be distilled and polymerized to yield terpene resin, which is sticky in nature and can provide adhesion properties to pesticides. It acts as a glue between the pesticides and the leaf surfaces. Due to the hydrophobicity of this sticky terpene resin, surfactants must be formulated with this sticker to render an emulsifiable product. In the adjuvant space, these surfactants are also known as spreaders. One of the challenges in pesticide application is that the active ingredients are washed off from the leaf surface, which reduces efficacy. This occurs, as most spray solutions or suspensions are water-based and have low affinity to waxy or hydrophobic leaf surfaces. Therefore, spray solutions or suspensions can easily bead up and run off under physical forces, such as irrigation and rain. A sticker-spreader is a type of adjuvant developed to improve retention of pesticides on foliage, especially under rainy conditions. At Ingevity Corp., a rain fastness lab test was carried out to evaluate the performance of a terpene resin-based sticker-spreader in the presence of an herbicide formulation. The level of active ingredient that remains on the surface after the rain was determined was characterised by percent retention. A strip of parafilm with a fixed surface area was selected to mimic the hydrophobic leaf surface. Rain was simulated by dipping the strip multiple times into water. 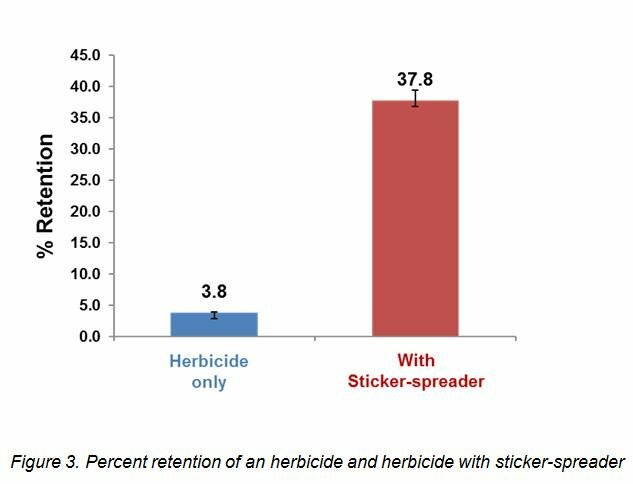 The addition of sticker-spreader to pesticide increased the retention by 30 percent, thus increasing the pesticide’s efficacy (see Figure 3 below). Copyright of this article by Agropages.com. We are sharing and promoting the market innovation.